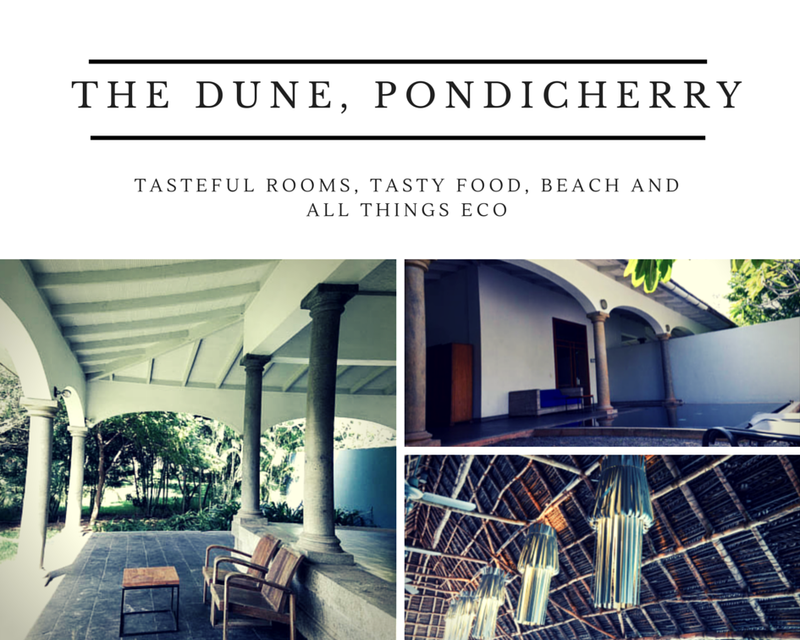 As we work on bringing together our series on "Weekend trips to Take in 2015" Pondicherry was one of the obvious choices. It fits our requirements perfectly with something quirky to offer and a place to suit everybody's needs. 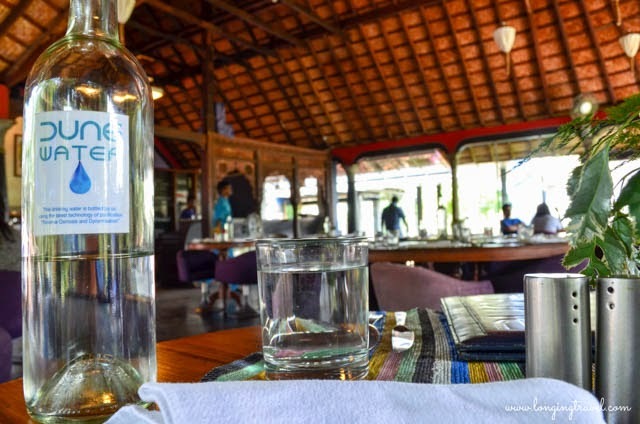 Then the search was on for places which in themselves would be interesting and comfortable for you our readers.Dune Eco group fitted our bill, their Eco resort in Pondicherry was the first one we talked to, and they were generous to host us for lunch and property tour. Here's a recap of all we saw, ate and a brief review of the resort. 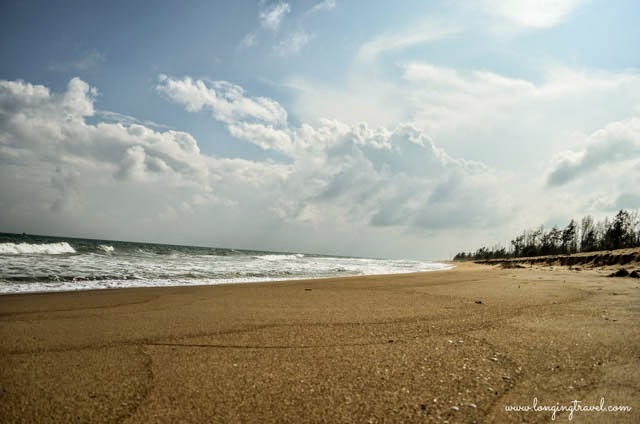 The resort is located in the outskirts of Pondicherry and lies in Tamil Nadu state 16 Km from city center. 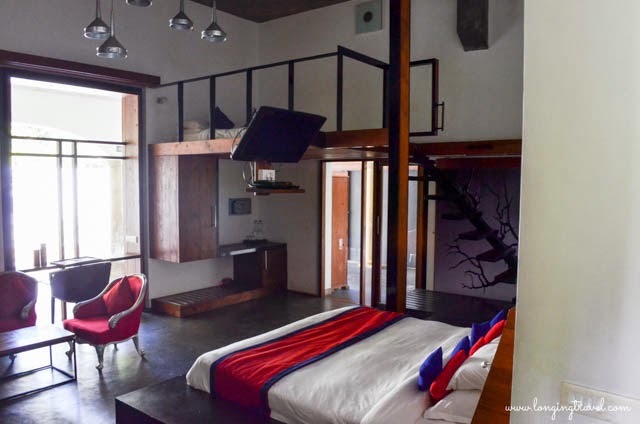 Dune is a bit on the higher end of the spectrum with total 55 rooms ranging from Non AC nature cooled cottages along the sea costing you around INR 6000 (100$) a night up to private luxury rooms with pool setting you back by INR 16000-18000 (265-300$). Every room gets two cycles so that patrons can move with ease around their 40 acre property. Room service gets food to your rooms even though the area is quite big. 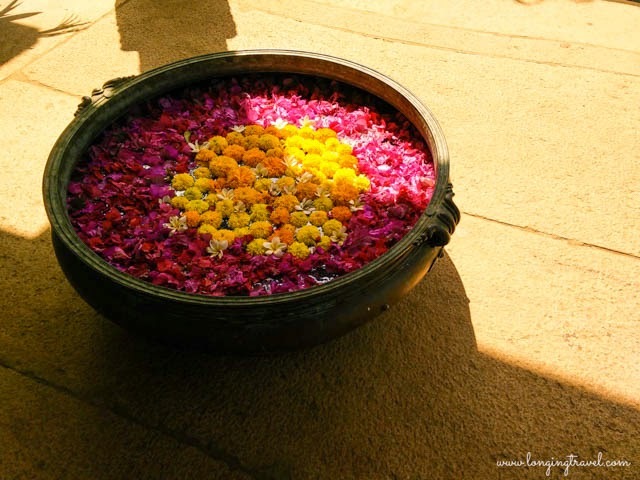 Spa- the spa offers Ayurveda massage and treatments ranging from a day to 21 days. Along with the spa there is a water treatment called The Watsu which relaxes you, and is only available at 2 other locations in India. They also have yoga classes and personal yoga coaching is available too. After a very satisfying late breakfast we directed our bike to Dune a modern village as per our host, even though the 16 Km sounded long the property didn't feel that far away. We were greeted by Subhajit at the reception for our tour to begin. Earlier we were told that they were completely booked and we did get evidence when around 4-5 couple walked in quick succession to the reception. The resort is spread over 40 acres, a vast expanse of land right next to the beach. 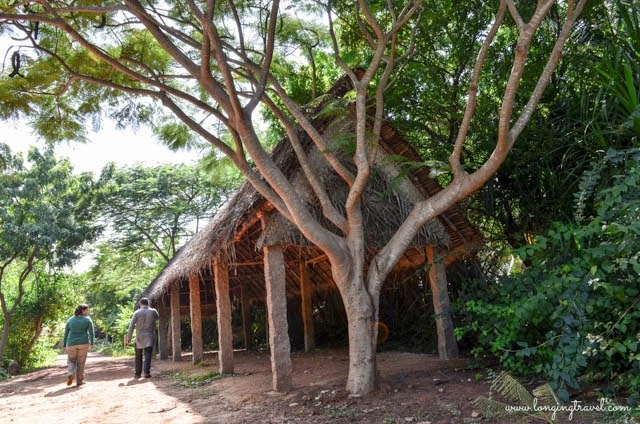 They claim to not have cut a single tree while building their 55 residences and other facilities. It looked like the case too with almost the entire property covered with one type of flora or the other. The designer and manager have both taken great pains to keep the details intact. Small things like the painted car (OK not small), use of mud vessels as dustbins and the direction totem create a laid back ambiance. Most of the furniture here has been re purposed or bought from other antique shops in and around Karaikudi and Pondicherry. Antiques like the fans, clubbed with artist creations (these lights) and my favorite lights refurbished with window blinds (cover image) bring forth the efforts taken to keep the place eco-friendly. 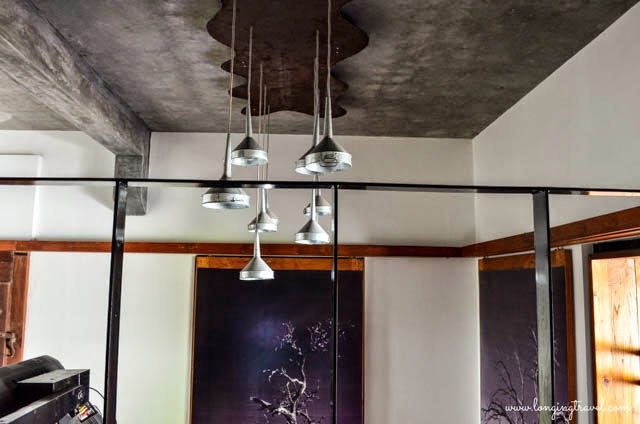 Repurposing is quite close to my heart and as an architect we both could understand how much time and energy it takes not just to reuse but also to maintain. The rooms are luxurious and quite a bang for your buck. Even though we could not visit a nature cooled room the images of those have me quite biased towards them not to mention a reasonable price and the fact that we rarely put the AC on. We loved the open bath and the pool setting, what I found missing is a mini bar counter but maybe they can arrange the same on demand. What we liked the most was absence of TV in some rooms and even in the rooms where they do have a television there are no soaps and serials playing, no cable means people get out of the room and enjoy the place. Or you can rent a DVD as you cosy up in the room. 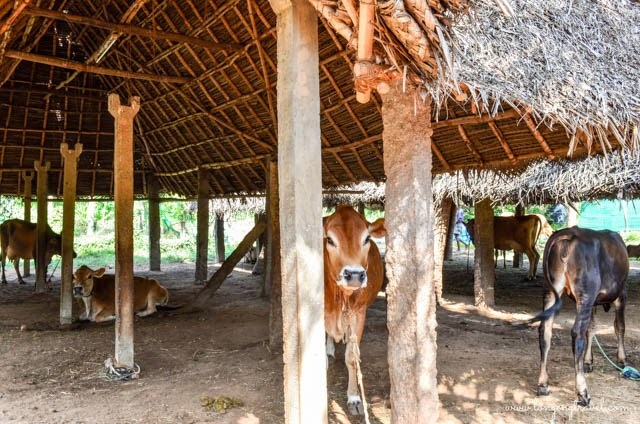 They grow quite a bit of vegetables on a small farm and also have around 7-8 cows, so if you have a milkshake here most probably it was from their own cattle. This helps them keep the food organic and fresh. Quick tip : ask them for a milking session if you would like to learn how to milk a cow. The reason why I would ever stay in a resort apart from all other creature comforts, is the pool. They have two of those, one for your toddler near the children's area and another for you. 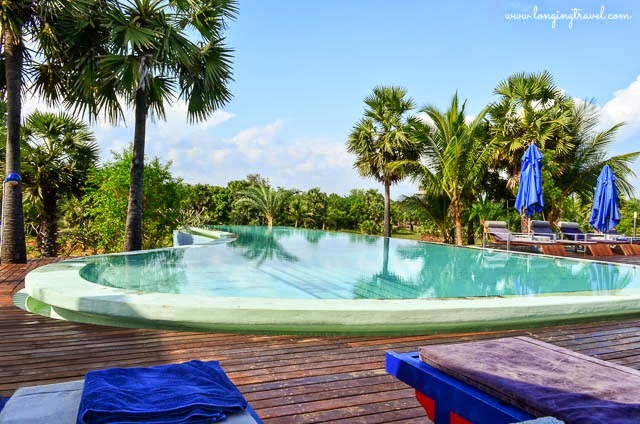 Adult pool is raised high on a deck, you can easily laze on a lounger and take in sea views. Right next to it is their snacks and sea food specialty restaurant (very convenient). Even if you are not living in the resort you can access their pool for 1500+ taxes for adults and 500+taxes for children. As we moved on to lunch both of us were almost sure that it was going to be awesome and indeed it was. Our only complaint was the time it took for food to reach us but as soon as we had our first bites or sips we were sold. Well balanced flavors and good presentation it definitely added to our Awesome Food Day in Pondicherry. "Low consumption LED, waste water treatments plants, Solid Waste Management System, no use of chemicals products anywhere, organic food, organic linen and bath amenities, re-afforestation programs, composting units, solar electricity in common areas, solar hot water systems, up cycling of old buildings into new rooms, buy local, employ local, invest in education, developing fauna and flora biodiversity"
I told you about how they have re-purposed stuff, well it's not just furniture, they have even moved houses from Kerala to reassemble them; still this was not IT. My favorite part was the wedding mandapa they have shifted from Karaikudi region and re installed here. 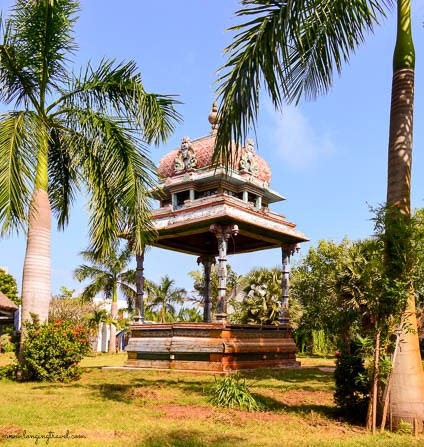 Over a hundred years old the mandapa must have seen quite a few weddings and you can add yours to the list too. We are already married or else I might have considered Pondicherry and Dune, how awesome it is to get married on a antique. Though they are a eco resort you will still find petrol/diesel fueled vehicles used to ferry guests around. It would not just be good but also more eco friendly if they switch to battery powered vehicles. Also bad electricity situation forces them to use DG which is not that eco friendly but I do appreciate them running common areas on solar power. Yup, Ajay loved the place and I definitely wouldn't give up so much luxury. It also would be a step ahead in us trying to reduce our footprint with small efforts. In case you would like to book your stay with them either send us a mail or just go directly to them here or book through agoda. We were hosted by the Dune Eco Group for a free property tour and free lunch, the opinions in the post are our own. Hello Ajay and Parul, tks for the sensitive article. Good remark for the petrol car moving around...we had a Mahindra Bijlee electrical car for many years moving around but they stop this product and we got stuck with spare parts...we are currently looking at a new one "made in India" but not easy to get..so far we have been offered only Chinese product...Have a good trip down south, take care. It is always nice to have a owner reply and address issues. You've got a great property... thanks for the best wishes.